How old do you think it is? Could it be by Picasso, who became interested in ceramics in the 1950s? Or are we talking 1980s Scandinavian? The answer is, neither. 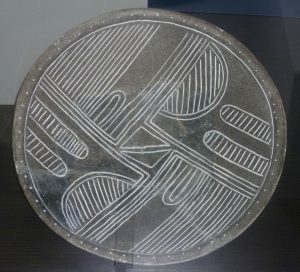 It comes from Bulgaria and it’s Neolithic, dating from 4000 B.C. And that makes it more than 6000 years old. 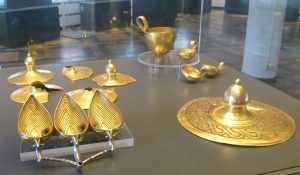 I had gone to Bulgaria to see its Bronze Age Thracian treasures, which were indeed spectacular. The Thracians arrived in Bulgaria from the Russian Steppes in about 4000 BC, bringing with them the art of casting bronze. Technologically, as far as bronze was concerned, they were superior; and the grave goods discovered in the numerous tombs were marvellous. However, the indigenous New Stone Age people they conquered created pottery which, in my view, was just as sophisticated and several thousand years earlier. For the rest of the holiday, whenever we visited a museum, I shot off to see the Stone Age pottery and left the Bronze Age gold artefacts for later. The tulip vase below is one of my favourites. It’s the size of a large goblet and it dates from 6000 B.C. which makes it 8000 years old. It’s contemporary with sabre tooth tigers and mammoths! Heaven knows what sort of pottery we were making in Britain at this date, but it certainly wasn’t of this quality. 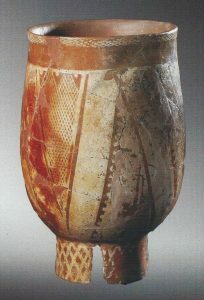 Tulip vase, from the tomb at Karanovo Tell, Bulgaria, 6000 B.C. If there is a moral here, it is surely that invaders are not always technologically superior to those they conquer. 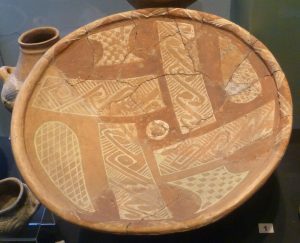 The Bronze Age Thracian pottery was fine but not, in my view, of the same quality; it was certainly not a patch on the Neolithic potters’ achievements. 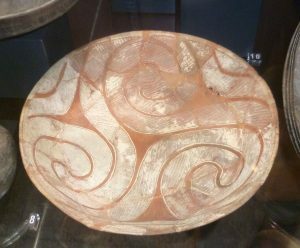 I found myself wondering if there wasn’t an echo of the sinuousness of the Neolithic pottery in the curves of some of the Thracian gold grave goods. Of course, it’s not a case of ‘either, or’. I am allowed to enjoy both the Neolithic pottery and the Bronze Age artefacts, and I did. But discovering the quality of the Neolithic, 4-6000 BC pottery was a huge and unexpected bonus. 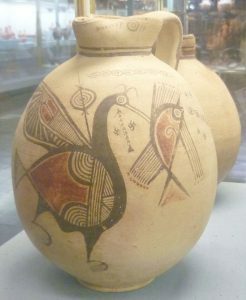 As a coda to this, when I later visited Cyprus, I discovered that their Bronze Age pottery was equally stunning. This stylized bird looks extraordinarily modern, given that it dates to 3500 BC. 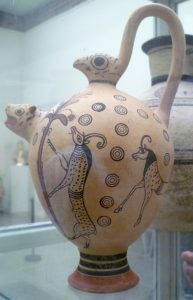 And I loved this elegant ewer with the stylized antelopes (the curly bits on top of their heads are horns), also Bronze Age and from Cyprus. And here it is facing the other way. I love the mixture of stylization and freedom of execution, and the black and white bands round the base. Whoever made it was a true master. 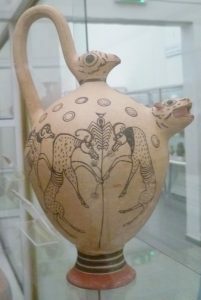 What I learnt from visiting Bulgaria and Cyprus was not to dismiss early pottery in museums as boring because, sometimes, it can amaze and astonish. What beautiful pieces. 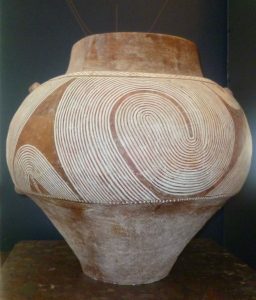 I love ancient pottery and these are quite spectacular. Thanks – I shall keep my eye open for more of this if given the chance. I’m so pleased you like them, too, Janet. There’s something very cheering about knowing that humans had their creative faculties in full working order from the word go. Good heavens, but how amazing is this? Truly gob-smacking to think of the age of some of these pieces. Beautifully done. Just shows we shouldn’t think “primitive” merely because it is way back in time. And I hadn’t known about the bronze artefacts either, so stunningly created. A treat, Elizabeth! Lovely, aren’t they, Elizabeth? What struck me was how startlingly ‘modern’ the designs seemed. I decided that I needed to reassess our ancestors’ abilities! Thank you, Elizabeth, for yet another delightful post. Because the figures in that most gorgeous ewer (love the handle) are sporting beards, I think they may be buck (or billy) goats. Stylized, of course. The feeding behavior shown on the reverse is most definitely goat-like to my eye. Of the antelope family, only the African gerenuk stands on its hind legs to feed. The gerenuk is very slender, like the images, but its horns are lyre-shaped. I vote for goat! A most fantastical goat though, to be sure. Thank you for your comment, Steve. I’ve just looked up wild animals of Europe and I think they may be chamois whose horns curve back in the same way. They are described by Wikipedia as ‘goat-antelopes’, so we are both right. Whatever they are, they are surely something special, with a touch of the heraldic about them. Chamois! You’re awesome. Always fun and enriching to visit here. Extraordinary and very beautiful. Very thought-provoking post.